In the year ahead I have to promise to stop indulging in such amazing meals. My sizeable arse is starting to pay the price and this just won't do. But as it's not the new year yet, I thought I had better get my "food on" in the most decadent manner possible. 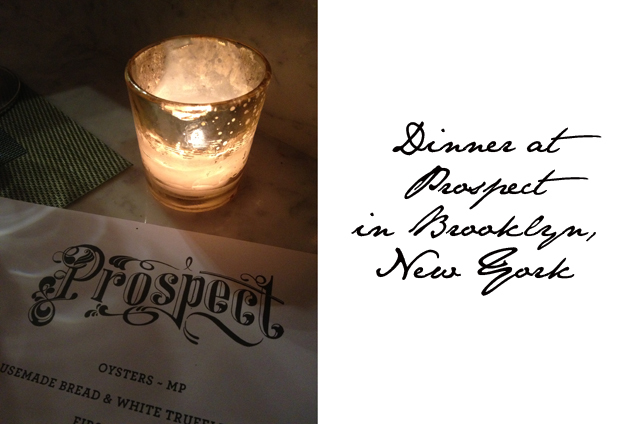 This is where I introduce Prospect in Brooklyn, a place where I'd be happy to spend my last night of indulgence. Last week I stopped into this local hero to check out a few dishes and nearly had to be rolled out the door by the time I had finished. I honestly can't remember a time I had eaten so much. I also have a hard time remembering the last time I ate so well. 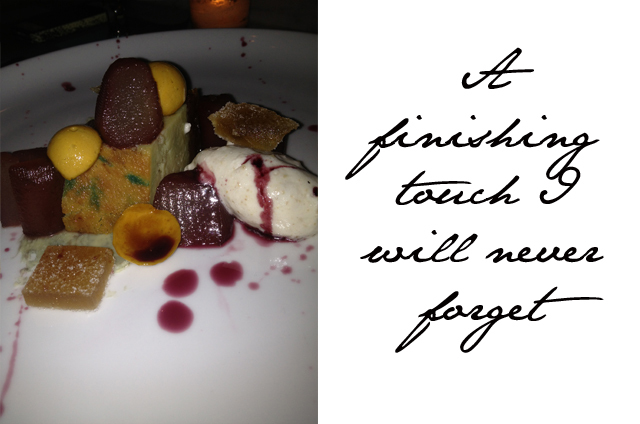 From the first course to the final surprise, I had nothing but compliments to throw towards the chef and I didn't have far to throw as we were seated at one of the most coveted positions in the intimate restaurant. 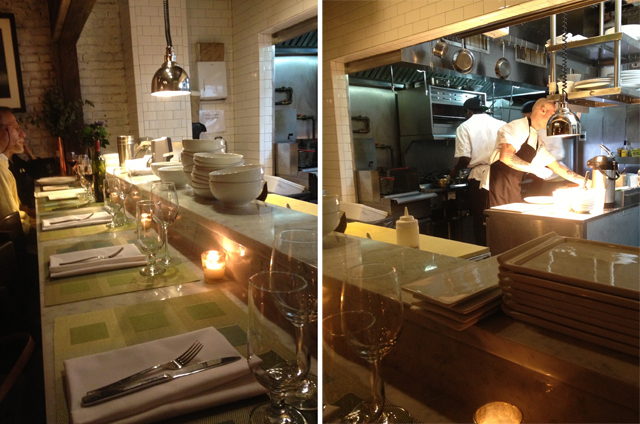 Our seats were at the chef's table where we were treated to the best live entertainment for a foodie... chefs in action! 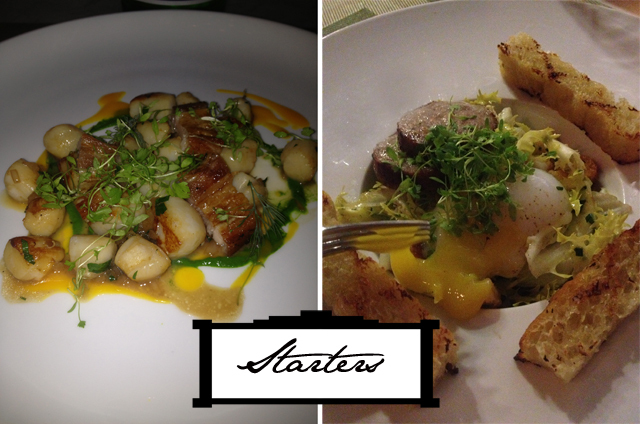 For a starter I ordered the Nantucket Bay Scallops. As I've lived in London for nearly a decade now, I have grown used to the idea that ordering scallops means getting three scallops on a plate and enjoying the decoration around them. Basically I'm used to starving when I order scallops. That is certainly not the case at Prospect where American portions are in full effect. I couldn't even count the number of scallops that arrived in front of me and I could barely finish the plate, even though each bite was just as sweet and fresh as the last. This could have easily been a starter for two. Of course, that wasn't the only starter that made its way onto our table. The chef also sent out the Slow Cooked Duck Egg after insisting this was a treat we couldn't say no to. Was he ever right. This take on the classic "Boiled Egg and Soldiers" was absolutely inspired. Who ever thought such a traditional dish could be translated into a gourmet starter? This is just one of the many inspiring moments discovered at Prospect. 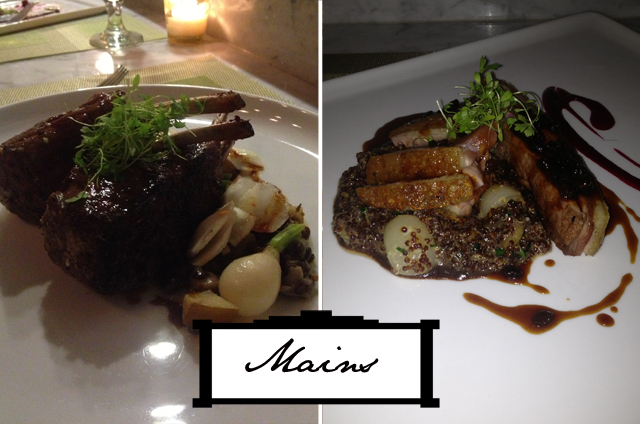 I had trouble narrowing down what I should order for a main. In the end, I went for the dish that everyone recommended. As I had asked around about the restaurant, there was one dish that each and every person confirmed as a must order... the duck. So I placed my order for the 14-day dry-aged Rohan Duck Breast while my dinner companion (my mother) ordered the rack of lamb. I will say I had food envy when her plate arrived and after tasting a bite of the lamb I will say I happily recommend this as a main dish. However, my duck breast was the most tender and flavourful duck I have ever had the joy of slicing into. I'm not sure exactly what the chefs at Prospect do to create such a marvelous mouthful, but I must salute them for knowing their way around a quacker. I do believe I have left the most unexpected delight for last. Just as we were about to throw our napkins on the table and yell "surrender", the most beautiful plate arrived. The waiter explained that the kitchen had taken the liberty of sending over their signature dessert. Called "The Roaring Forties," I did wonder what we had gotten ourselves into as the waiter explained we were soon to bite into a blue cheese cheesecake. Have you ever heard of something so absurd? Yes, folks, this is one of those moments where you mustn't judge a book by its cover. As we both took our first forkful and prayed for decent results, our tastebuds nearly leapt out of our mouths in delightful surprise. This odd dessert was a raving success. Paired with red wine poached pears, honeycomb candy and walnut creme, this blue cheese cheesecake dessert is from another world of culinary delights. I will say no more, but only warn you in that we are still raving about this dessert a whole week after returning from NYC.